Transporting things from one place to another can be a difficult task. You cannot be sure what might happen in the middle of the road--or anywhere in the world, for that matter. That is why you need to find the best ratchet straps to secure your possessions. Strength to rule them all! For our editor’s pick, we chose Fortem’s Heavy Duty Ratchet Cargo Tie Down Straps. Despite its relatively low price, Fortem prides itself with its heavy duty construction and high-quality materials. This product, in particular, is assembled with weather-resistant stainless steel hooks, sturdy metal tightening mechanism, and webbed polyester fiber straps. Having a load capacity of 500 pounds, it is highly ideal for those heavy cargos. The whole package includes some handy and versatile tools. Buying this package would give you (4) metal ratchet buckles, (4) hook straps, (4) 15 feet straps, (4) soft loop straps and a carrying case. Fortem offers a lifetime warranty for all of its products, unlike other brands. No exceptions. It is very lightweight, yet it does not compromise on durability. It only comes in a neon green color. Unlike other brands that come in different packages and colors, Fortem’s ratchet strap options can be a little limited. When buying online, there are several issues about getting the wrong product. As for the alternative pick, Vault Cargo Management made it to the list. 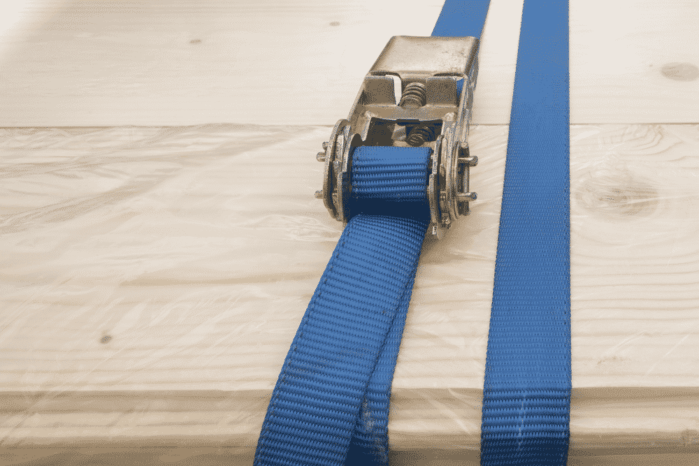 Its premium ratchet ties down claims to have been made only with industrial grade straps. Its handle is molded and ergonomically designed. The “S” hooks are also rubber coated to avoid damaging your cargo or your car paint. Last but not the least, it comes with a stowaway bag to make carrying and storage easier. All in all, Vault Cargo Management is highly ideal for the outdoors. Vault Cargo Management offers a money back guarantee. In case you encounter any issues or you are not satisfied, you can have your money back. The rubber coated release trigger is an excellent additional feature to avoid getting hurt when releasing a jacked up or twisted ratchet. Because of its high break strength, it holds up bigger and heavier cargos pretty nicely. The opening of the S hooks can be pretty broad. If your cargo is not that big, this might be an issue as it can get wobbly. The straps can come off as a little bit narrow. If you’re looking for something that is both good yet won’t break the bank, then Cartman’s Ratchet Tie Down might be a good option for you. 15 feet in length, this ratchet strap in two colors (yellow and orange) and two sets (the 4PK and the 6PK). Similar to the first two products, buying Cartman’s would include a storage bag and the four ratchet straps. It is ideal for moving appliances, and camping or other outdoor equipment. Cartman offers warranty for parts in case you encounter any issues or damages. It is much cheaper compared to other brands yet works as advertised. For a set that comes with a storage bag and four straps, it is very cheap. It is very versatile as Cartman offers a broader range of options in colors and sets. Unlike other brands that have a limited variety, Cartman can be pretty versatile in this aspect. The instructions that come along with the product can be a little unclear. You might have to search for actual videos if you want a faster way to learn how to use it. The release function and the ratchet itself might not be the best for more substantial and more significant cargos. Now, if you are willing to spend a few more bucks getting an upgraded ratchet strap, then Lockdown’s might be for you. Lockdown’s Premium Ratchet Straps comes in an eight-piece set. The straps are durable enough for you to tighten them as much as needed with no worries about breakage. Unlike other straps that give out once you tighten them too much, Lockdown is durable enough to withstand this. The molded handle, large release lever, double J Hook and webbed straps are excellent features to make your ratchet strap last a longer time. The product is well-made, and its materials are of good quality. That is what makes it different from other straps that are sometimes a little flimsy. It can get expensive especially if you are not willing to shell out a lot of cash for ratchet straps. They can get pretty heavy due to the thickness of the straps. That might become an issue if you are trying to pack light for outdoors. Last but not the least would be AUGO’s 4PK Ratchet Tie Down Straps. AUGO offers two different packages. The first kit comes with (4) ratchet straps and (2) bungee cords. The second package includes (4) ratchet straps and (4) elastic loops. 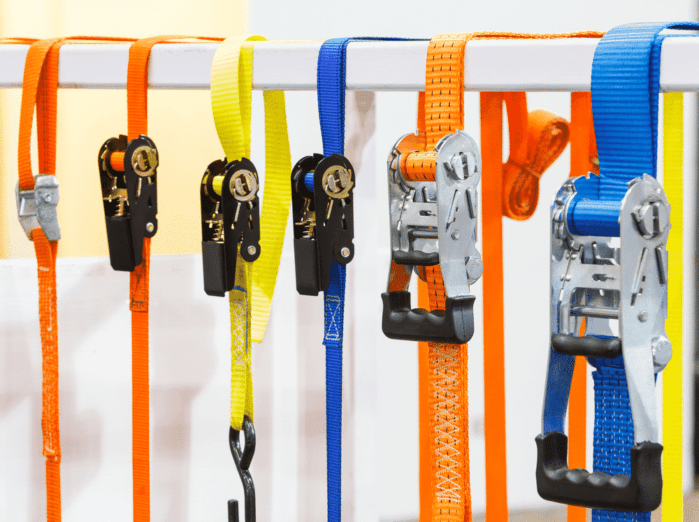 Claiming to have a revolutionary design, these AUGO Ratchet Tie Down Straps have rubber coated “S” hooks, molded handles and heavy-duty straps. That makes them highly ideal for your everyday wear and tear. AUGO offers two different packages. That can be very helpful since you can choose to either get the bungee cord bundle, the soft loop bundle or even both. Similar to the other products listed above, it also has rubber coated “S” hooks and molded handles. This makes the straps more durable and cargo or vehicle friendly. The products that come with materials that work as advertised. Even the soft loops and the bungee cords work as good as the ratchet straps themselves. The release can get pretty hard, especially with bulky cargo. The straps might not be as extensive if you're looking for really wide and thick ratchet straps. 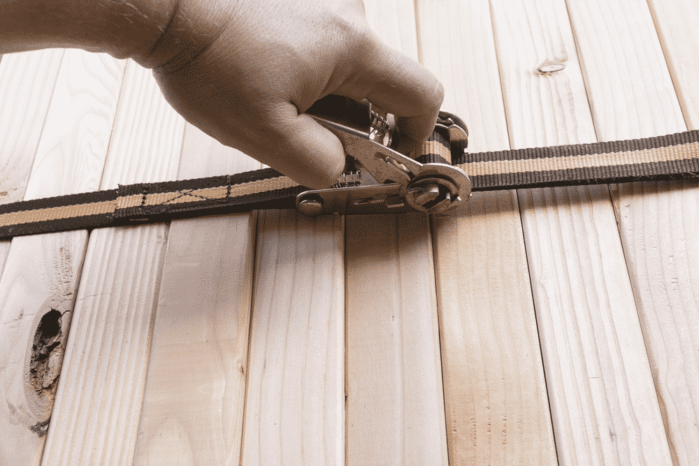 A ratchet strap is your go-to tool when you need to tie and secure loads and other materials. It is usually used to protect cargo boxes during shipping. In fact, the ratchet strap is already a fixture in the transporting business. On a smaller scale, the ratchet strap is also a purposeful household material. You can use the ratchet strap when you need to tie something to your vehicle. In fact, some people are so inventive that they used ratchet straps to tie their roofs. These examples are only some of the many ways you can make use of the ratchet straps. Its purpose is not limited to just tying some things together. The ratchet straps are proven to be helpful with a whole lot of other things. 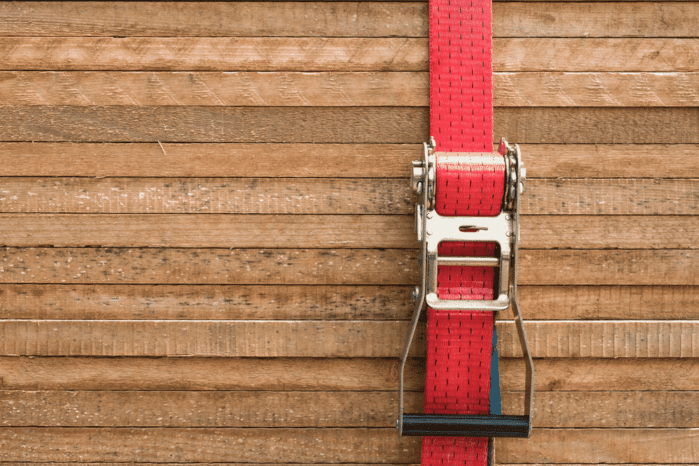 The polyester webbing is the main reason behind the reliability of ratchet straps. Without this material, the ratchet straps will not have the strength that it has. It also will not be resistant to certain extreme conditions. Polyester is the primary material of polyester webbing, which is composed of 85 each cent ester. This ester is the component provides the polyester webbing with durability. Naturally, it is nature’s gift to our worries. Perhaps the most important detail to note is that the polyester webbing can withstand extreme weather conditions. Even during a typhoon, it will not easily break due to high winds. Thus, the best ratchet straps are the ones made of polyester webbing. When choosing ratchet straps, you might want to check its components. If it is available, you can check how much polyester they used in creating the ratchet straps. In this way, you can assure that it is of good quality. Ratchet straps are also high enough to be used in pulling malfunctioning vehicles. For example, the ratchet strap can be attached to the end of your car for another car to draw it. This way, you don’t have to worry about looking for metal chains. Ratchet straps do not break easily. Thus it can withhold a tremendous amount of load depending on its strength. Based on professional testing, a ratchet strap can hold 3,000 to 6,000 pounds on average. However, more improvement can allow additional load. The ratchet straps may also be used to tie certain things to a moving vehicle. For instance, you can link a bicycle you bought to your car instead of waiting for it to get delivered. If some boxes can’t fit inside, you can tie it on the roof of your vehicle. There are even some surprising ways you can use ratchet straps. Instead of using clamps to lock woods together, the ratchet straps can serve as a replacement. There are also pieces of furniture (often, bed) that you can build using ratchet straps. Recently, there is news about ratchet straps being used to secure roofs of houses. In the midst of typhoon or hurricane, it turns out the ratchet straps can even save your life. That is why it is essential to choose the best ratchet straps. Ratchet straps do not break easily. Thus it can withhold a massive amount of load. According to testing, a ratchet strap can hold 3,000 to 6,000 pounds on average. However, more improvement can allow additional weight. Aside from being able to withstand intense weather conditions, ratchet straps are also said to have low water absorption. That is good because water tends to stretch materials. You do not want your ratchet straps to extend and become loose. One of the most appealing things about ratchet straps is that it is not stretchable. Unlike garter, it does not quickly become loose because its primary purpose is to secure loads and materials. The ratchet straps can be suitable for a lot of situations. That got proven by some of the instances users used it, and its evolving functions. The limit is how much weight and volume the ratchet straps can stands. Finally, ratchet straps are very cost effective. Ratchet straps can last a long time depending on how you use and take care of them. For a certain amount of money, it is even possible to use it for life. Most ratchet straps come together with a ratchet. A ratchet is made of metal and looks almost like a buckle of the belt. That is where you can wind the ratchet strap to adjust it when necessary easily. Ratchet straps vary in thickness measured in inches. The 1” or 2” ratchet straps are the ones used to tie around boxes are lighter loads. Meanwhile, the 3” and 4” ratchet straps are usually used for heavier loads, and even hauling vehicles. Make sure that in choosing ratchet straps, you consider both its strength and the weight of your load. Ratchet straps come with values that measure their strength. This power should give you an idea up to what point it can hold until it breaks. 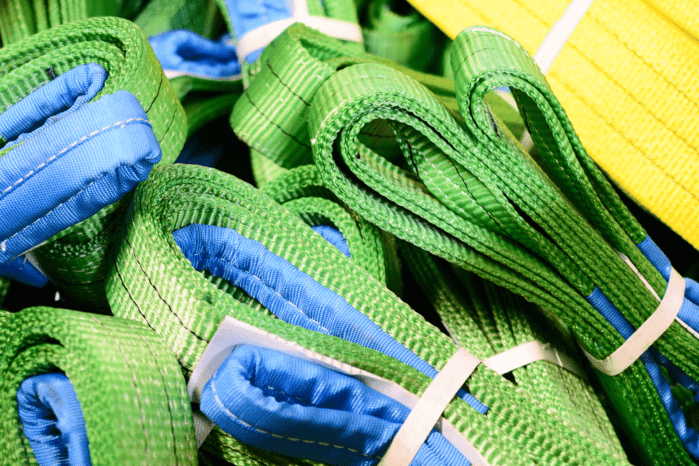 Aside from length and thickness, ratchet straps also come in a variety of colors. Usually, you would like ratchet strap in dull color if you do not want it to get dirty quickly. However, you can choose brighter colors since it is more visible in the dark. Sometimes, ratchet straps do not automatically connect to the metal ratchets. You must attach them on your own otherwise it would be difficult to use it. The good news, doing this is almost like fixing your belt. Unlock the ratchet first by lifting the upper portion. After this, you must insert the ratchet straps and pull it inside. Once enough belt is inside, add it again through the opening then drag it outside. When the ratchet strap is secured, you just pull the end and lock the hook together. In some instances, you need to hook it to the edges of the one you are attaching it. The important thing is, the ratchet straps are tightly securing the load. If you want to replace the ratchet straps from the belt, you can do these steps in reverse. Unlock the ratchet carefully. Pull out the ratchet strap slowly and gently. When you buy ratchet straps, you surely want to be able to use it for a long time. To do this, you need to take care of it properly. Disposing of it after using it just once will be impractical. One way you can maintain the quality of your ratchet straps is to keep it well when not in use. It’s true that ratchet straps can withstand extreme weather conditions, but it must not get exposed to too much sunlight. Ultraviolet rays may damage the polyester. You must also make sure that the ratchet metal is free of rust. Too much rust makes it difficult to adjust the ratchet straps. It can also damage the ratchet strap by staining it with its color. Every once a while, you also have the option to wash the ratchet straps. The polyester material in ratchet straps is also suitable for clothes fabric. Thus, a detergent and brush will not destroy it. Who knows that a simple strap can do a lot of things? Ratchet straps are not just for tying and securing use. As you have discovered, it is useful for broad types of loads and materials, and even protecting a house roof. For so many years, ratchet strap is a source of convenience. It had even become a large industry that helped the improvement of shipping. A lot of households make use of it, and life has been made easier. Thus, it is essential to examine the kind of ratchet straps you are purchasing thoroughly. Remember always to check its strength and the load that it can withstand. You want the best deal that your money can afford. If you want to play it safe and not spend bucks for a first try, Fortem’s Heavy Duty Ratchet Cargo Straps might be a good option for you. It is not too expensive yet at the same; it does not compromise on quality as well. But aside from its key features such as the weather resistant stainless hooks, Fortem also offers a lifetime warranty ensuring you of your money’s worth. Although all five products work very well as advertised, in the end, it’s your budget and needs that should win. We wish you luck in finding the best ratchet strap for you! If you found this article helpful, please let us know by commenting down below or sharing. Thank you!